Never forget a password again! Identity management company Sxip has released a Firefox extension called Sxipper ("Skipper") that remembers every password you enter and also auto-fills registration forms. Your personal information is encrypted and stored on your computer so privacy concerns should be minimized. A Sxipper dialog box opens up when you need to login to a site, and you can choose how much information you want to release to the site. Interestingly, you can create and contribute something called a semantic map that lets Sxipper know how to fill out a form. Something of a social element in all this. Sxipper is also OpenID compatible so as that standard becomes more entrenched, you'll be able to more smoothly logon around the web. One thing I am concerned about is the size of the extension: it weighs in a 2.1 MB, which is huge for a Firefox extension. Given that Firefox has a built-in password manager, and there are alternative form fillers, you might want to pass this up if space and speed are concerns. 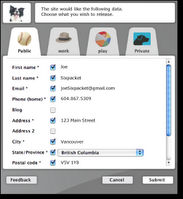 If not, Sxipper looks like a nicely designed tool for more efficiently managing your online identity. Second Life Contributes to Global Warming?